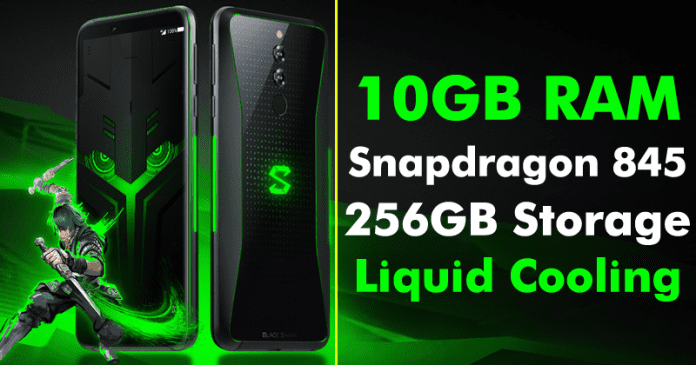 We all know very well that a few months ago, specifically in April of this 2019, the well-known Chinese smartphone manufacturer, of course, Xiaomi surprised the world with the launch of its first gaming smartphone, known as Black Shark. And today the company has just launched the world’s first 10GB RAM gaming smartphone with the liquid cooling system. A few months ago, specifically in April of this 2019, the well-known Chinese smartphone manufacturer, of course, Xiaomi surprised the world with the launch of its first gaming smartphone, known as Black Shark. And today the company has decided to update it to show us a second version even more powerful, which not only gets to catch up but seeks to be crowned as the best smartphone for gamers in the world. This is the Xiaomi Black Shark Helo, which in the end will become the first smartphone in the world to have 10 GB of RAM, with an aggressive look and focused on exploiting its capabilities for the most demanding games. In fact, the well-known Chinese smartphone manufacturer, of course, Xiaomi will sell it with a kind of Joy-Con, with joystick included, with which they seek to put it at the height of the Nintendo Switch. Just six months after the debut of the Black Shark, Xiaomi brings us an interesting update for its smartphone for gaming, which presents a redesign focused on the audio and even more aggressive external appearance, but without neglecting the interior. On the front, we have a 6.01-inch AMOLED screen with Full HD+ resolution, 18:9 aspect ratio and compatible with HDR content, in addition to an illumination of up to 430 nits with DCI-P3 colour space. Here we also have a reduction in the frames to show us a cleaner look free of buttons, where we only have, in addition to the screen, a pair of speakers with 3D stereo sound and the front camera of 20 megapixels. In the frame of the device, which is made of aluminium and now under a more rounded and ergonomic design, we have a band with RGB lighting, while the back went to the glass to give the device more premium look. Here we find a double-tone LED flash and the dual camera of 20 and 12 megapixels, as well as the fingerprint sensor. Finally, this back is crowned with the lake of the Black Shark brand that, like the Razer Phone 2, incorporates its own LED lighting system. As we mentioned, the interesting part of this Black Shark Helo is its interior, where we have different options of RAM and storage, which gives us three configurations: 6/128GB, 8/128GB and the most powerful of all that is 10GB of RAM with 256GB of internal storage. This is complemented by the Qualcomm Snapdragon 845 and a cooling system by means of two two-phase thermosyphon tubes (cooling pipes), which promise to keep the CPU temperature at about 12 degrees. This cooling system is activated by activating the ‘Shark Space‘ mode through a special button, which limits the use of applications and services in the background to give priority to performance. The rest of the specifications are complemented by a 4000 mAh battery with Quick Charge 3.0, 4G LTE connectivity, Bluetooth 5.0 and MIUI 10 over Android Oreo 8.1. The Black Shark Helo will be compatible with a full pad that will have its own touchpad and a pair of joysticks. This pad will be sold separately at a price which is not yet announced, and its goal would be to use the device with both hands, in addition to improving the cooling system by incorporating their own fans. As it happened with the first version, this Black Shark Helo will only go on sale in Chinafrom next October 30, and so far there is no information about an international version. While now if we talk about the prices then let me clarify that we have already mentioned the prices above in the specs chart of the device. So, what do you think about this? Simply share all your views and thoughts in the comment section below.